A few weeks ago I was waiting in line at the post office to post an international order when I noticed the Bobble Water Bottle. I think it was the sleek design with the fun range of colours that first got my attention﻿ but as I read more info on the display and researched the bottle online I discovered this genius new invention - one that makes you go "Why didn't I think of that?" 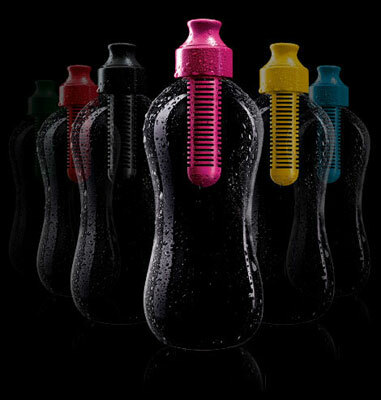 The Bobble Water Bottle has a colourful filter that filters out organic contaiminates such as cholrine from your tap water, which will make your tap water taste much better as well as being better for you. The filter can be used for 2 months or approximately 150 litres and comes in a range of colours. The bottles and the filters are made in the USA rather than in a sweatshop in China. They are recyclable, reusable and are made out of 100% recycled PET which is BPA free. If that isn't enough to convince you that this product is amazing...they retail for about $15 each with the filters costing $10, which for a filter drink bottle which is eco-friendly is great value, especially when compared to stainless steel water bottles which can cost around $50. And if you're a bottled-water addict you'll definately be saving money in the long run.